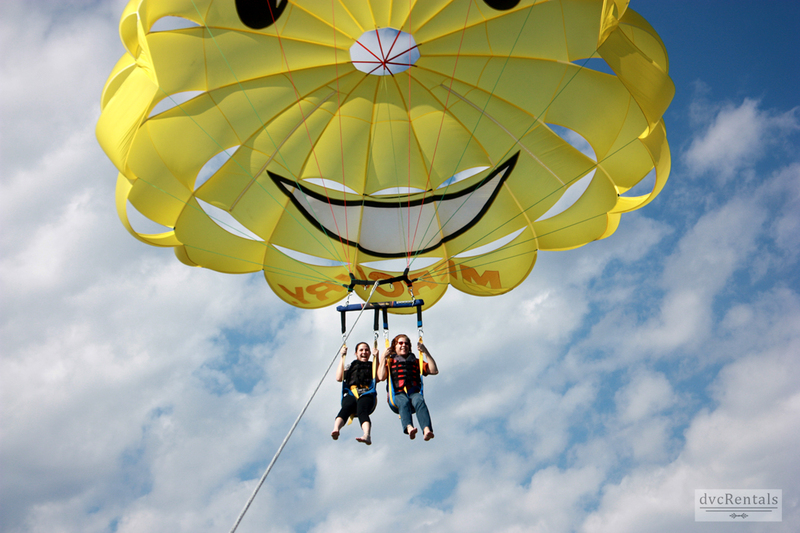 While there are many thrill rides at Walt Disney World, the most thrilling (in my humble opinion) is parasailing at the Contemporary Resort. 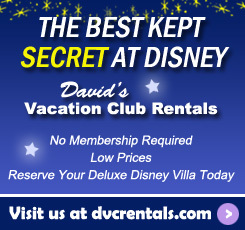 This experience is not technically run by Disney, even though it is located on Disney property at Sammy Duvall’s Watersports Centre. However all of the employees at the Centre were as warm, welcoming and friendly as any cast members I have ever encountered. 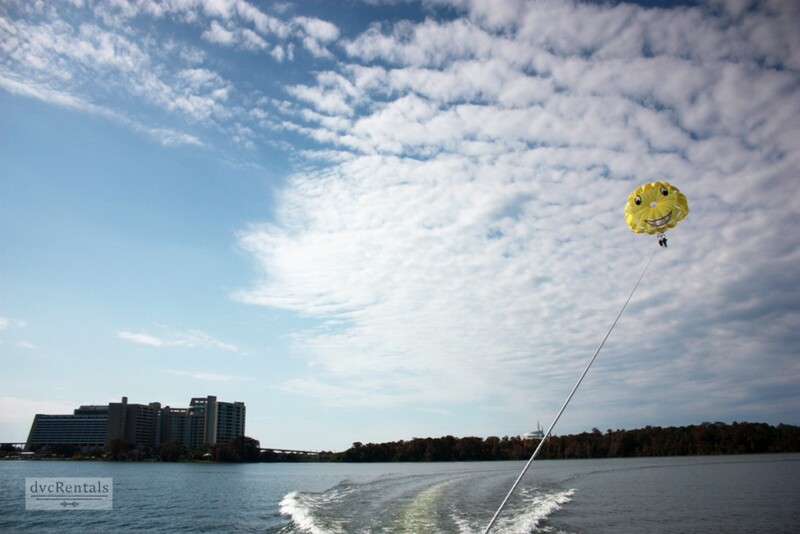 Along with wake-boarding, tubing, water skiing and boat rentals, Sammy’s offers a wonderful and unique view of Walt Disney World property via parasailing. My daughter Sarah wanted to do something special with me for my 60th birthday. 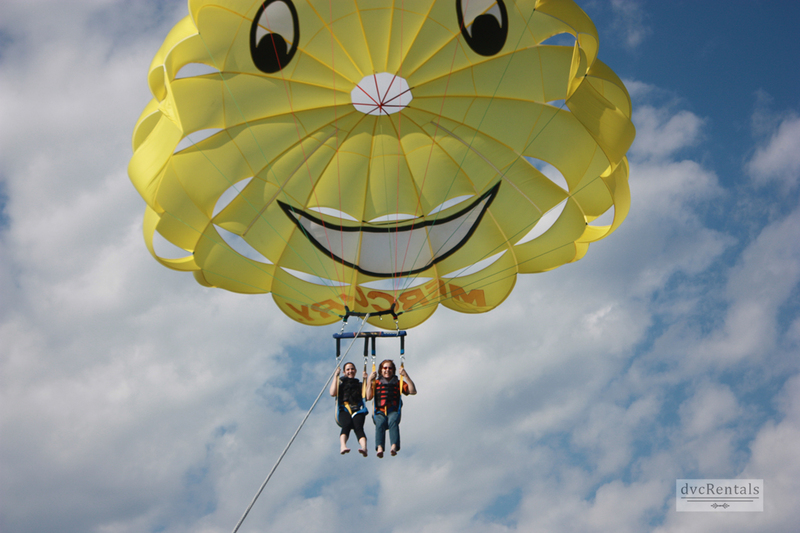 She found a Groupon for Sammy Duvall and since I had said I wanted to try parasailing, she bought it. I must admit I was a bit leery at first. Even though it looked like a lot of fun I kept putting off doing this until Sarah bought the Groupon. Heights are definitely not my thing, and I was afraid I would be too nervous to enjoy myself. However I decided I was not going to let my fears get the best of me, and I am so glad I didn’t, as this was a completely relaxing, yet exciting and unforgettable experience. We called ahead of time (strongly suggested) to make our reservation. There were a number of dates available, we chose one that was good for the two of us. 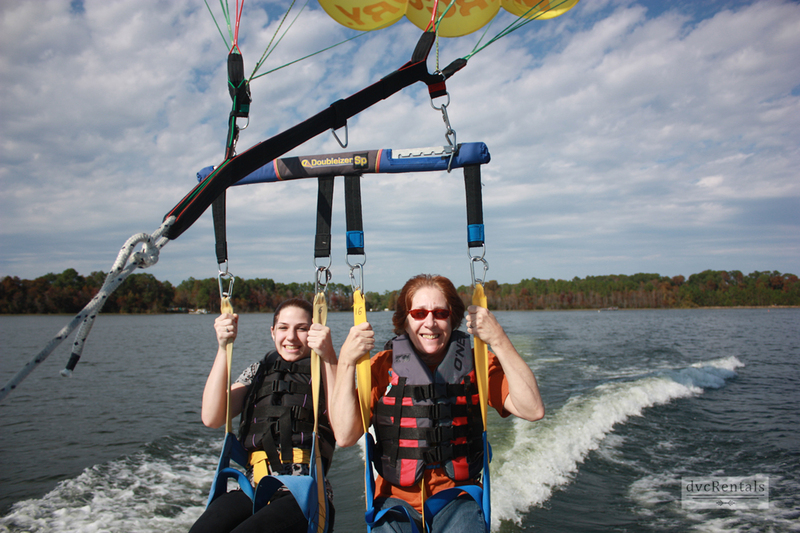 This experience can be done as single riders or in tandem with two riders strapped in together. We did the tandem ride. We were told there was a weight requirement of 130-330 lbs, tandem or single. If doing tandem and one rider is under 130lbs but the other brings the total to over 130 that is acceptable. The age minimum is 6 years old. We were advised that if it rained we would have to reschedule our flight. Sammy Duvall’s is located at the Contemporary Resort marina on Bay Lake. If you have reservations to parasail you will be allowed to park at the Contemporary, just let them know at the guard gate. The day of the flight we arrived 15 minutes early, as instructed. We were asked to sign a waiver (if you bring a child under 18 there must be a parent to sign the waiver). There is no need to bring a bathing suit, since you land right on the boat once the flight is over you don’t get a bit wet. The person who signed us in was a very personable young lady. Once we signed our waivers we were directed to go to an area near the water where our instructor and boat pilot would meet us. We were REALLY lucky that the weather was just awesome that day. Not too hot, not too cold and sunny and clear skies. Sarah and I chatted for a little while, and before we knew it was time for the ride! The instructor was extremely nice, and took plenty of time to explain everything to us and answer our questions. We did not feel rushed in the least, and the laid back and friendly attitude of our instructor alleviated most of our anxiety. The boat captain was quite nice as well, but we mostly interacted with the instructor. We were fitted with a harness and lifejacket, and told to remove our shoes. I’m not too sure why, but I have to say it felt great to feel the wind on my toes when we were in the air – it beat Soarin’ by a wide margin. Cameras are allowed on the flight, but only if they have a secure strap.Instead of taking our own pictures we opted for the instructor to take pics from the boat. It was an extra $25 but well worth it. He took over 75 pictures which we received in the form of a memory card to upload to our computer. There were shots from all angles and heights. He did a really excellent job in capturing the experience. Additionally, having someone else take the pics means you can enjoy the flight even more, as you can completely sit back, relax and just enjoy the view. Once we were all set with our harnesses and life jackets on it was time to fly! 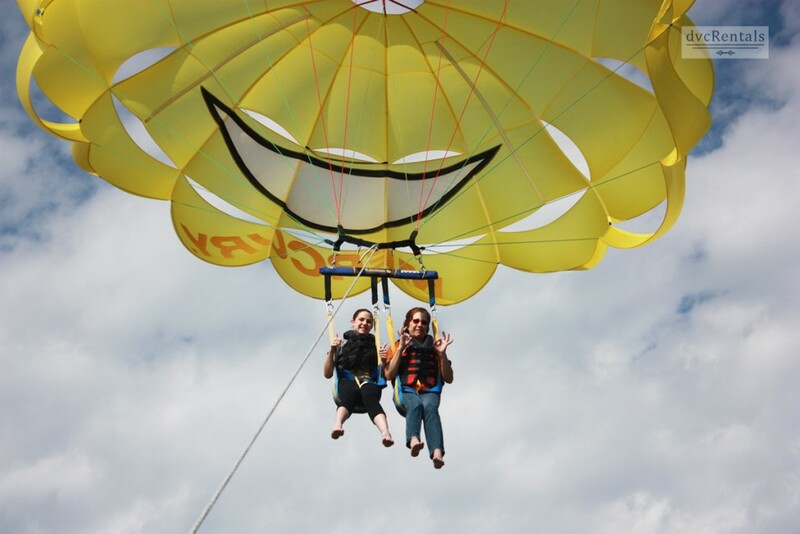 The instructor said if we wanted to come down to signal to him by waving our hands back and forth. It was comforting to know that if for some reason one of us freaked out (and that someone would have been me, Sarah has no fear, LOL) we would be able to be brought right back down. 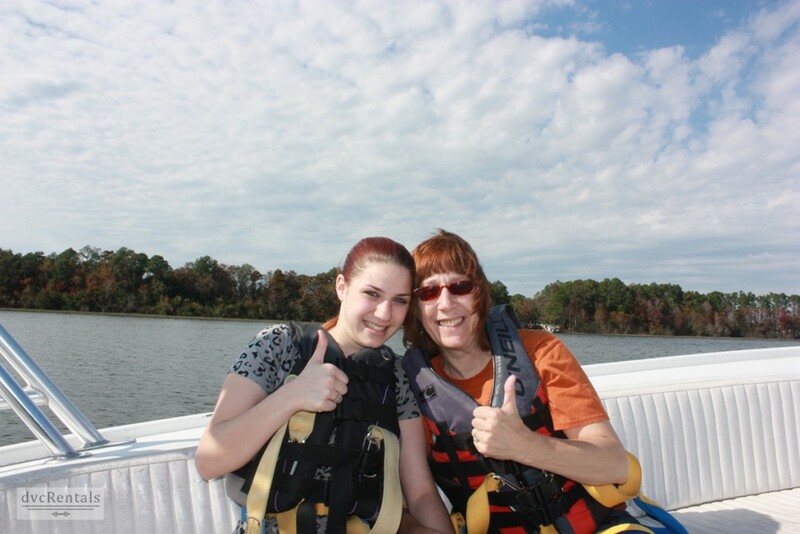 We were strapped into a special seat, as we stood on the back of the boat, held onto the straps we were instructed to grab, and then off we went! We got up in the air immediately, but it took a couple of minutes to reach maximum height. I felt a tad nervous for the first minute, especially when the boat turned and made the seat tilt a little. But I got used to the feeling very quickly, as you are strapped in very securely. I was able to relax and enjoy the very unique view from the air. Below us we could see all of the Magic Kingdom resorts. It was very cool to see the Contemporary, Polynesian, Grand Floridian, Wilderness Lodge from above. There is also a wonderful bird’s eye view of the Magic Kingdom from up there. Each time we circled the area I’d notice something I hadn’t seen before. The flight lasted ten minutes and the time went really fast, it was so enjoyable. They reel you in with a strong cable when it’s time to come down. We landed smoothly on the boat, no issues at all, completely dry. Sarah and I enjoyed every second of this experience. Exhilarating is the best word I can use to describe it. 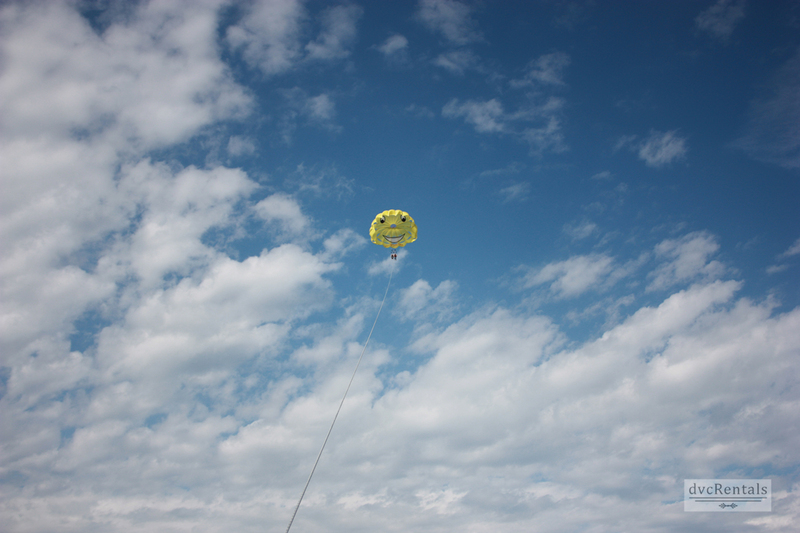 It really is a natural high to fly like that, and I will definitely do it again someday. If you are prone to motion sickness it is probably a good idea to take Dramamine or some similar sort of medication before flying. Although far from sick I felt just a tad queasy and if I did it again I’d take something. Friends can go along in the boat and take pics of you. They do not need to be on the reservation, and usually can be accommodated but there is NOT a guarantee of this. Up to six people can fit in the boat. Cost is $95 for 8-10 minutes at a maximum height of 450’ for a single rider, $130 for 10-12 minutes at maximum height of 600’. Tandem riders are $170 for 450’ and $195 for 600’. 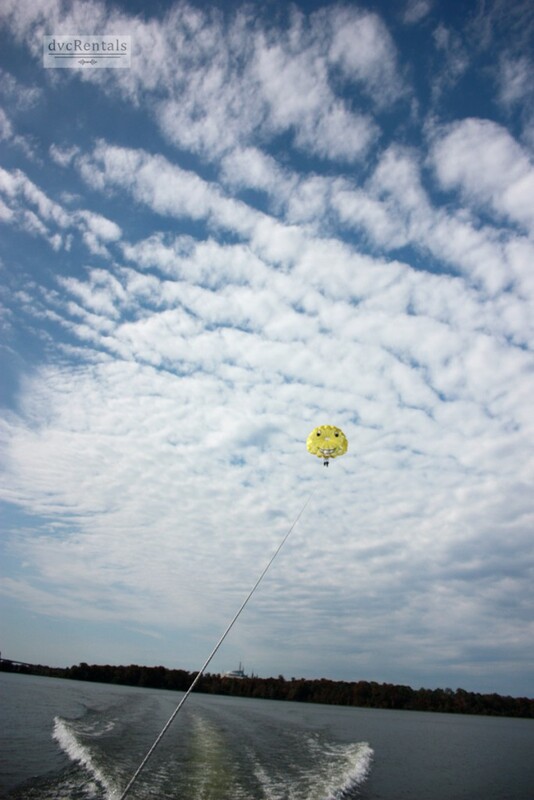 At the time of this blog entry there are currently no Groupons available for parasailing, but they crop up every now and then, so if you plan to try this check the Groupon site before you book. AllEars.net offers a coupon for 15% off on their site. 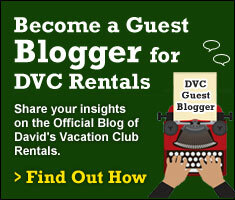 There are Cast Member discounts available, as well as 10% off for Annual Pass Holders and DVC members. This experience can be booked 7 days a week, weather permitting. Flights depart every half hour between 9:00 am and 4:30 pm from March 15th – September 14th. Flights depart every half hour between 10:00 am and 4:30 pm from September 15th – March 14th. 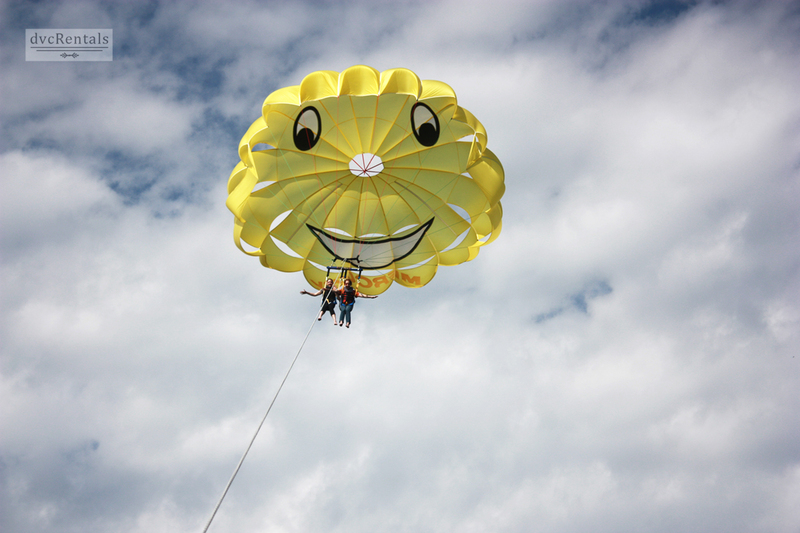 8 thoughts on "Parasailing at Disney’s Contemporary Resort"
My son and I did this a few years ago, was fun! Got a discount through groupon at that time. Did it. Saw a gator! Jeff Halstead better read up!! This is what I am most looking forward to on the whole trip. My family did it one year. Great experience. There was another lady on our boat who was trying to get over her fear of heights and asked to go first since she didn’t want to chicken out if she waited. She came back down proclaiming it to be wonderful! My DD and I did it and it was SO COOL!! The views were awesome! !